Village Islamists order end to raising pigs. NAIROBI, Kenya (Morning Star News) – Muslims in a village in eastern Uganda last week killed Christians’ pigs and tore down their church building, sources said. 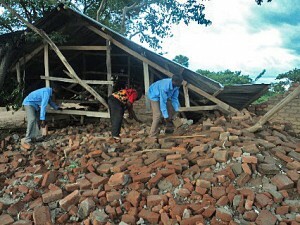 A Muslim mob demolished the building of the 450-member Nalugondo Church of Uganda building at about midnight on April 12, shouting, “We cannot live together with neighbors who are infidels. We have to fight for the cause of Allah,” according to area sources. Nalugondo village is near Bugade, Mayuge District, 93 miles east of Kampala. Two days earlier, sources said, a group of Muslims slaughtered a church lay leader’s pigs, a key source of income. Singing praises to Allah and shouting, “Allah only is to be worshipped, and Muhammad is his prophet,” the group led by area Muslim Kambo Daudo killed Samuel Kijali’s pigs at 4 p.m. on April 10, as Kijali’s wife watched helplessly. A few weeks before the slaughter, Kijali had received text messages on his phone saying that church members must stop raising pigs. Muslims also sent a text message to church member Kamaala Yokosani – “We are soon coming for the heads of your pigs” – before killing eight of his pigs on April 5, sources said. Yokosani was elected chairman of the Bugade zone in May 2015, and then later he began raising pigs. A Christian witness said a Muslim neighbour of Yokosani, 60-year-old Kupoota Amisi, went to his home with about 15 other Muslims. “I saw Amisi with a group of people enter Kamaala’s farm with knives, only to hear the following day that his pigs had been killed,” the witness said. About 85 percent of the people in Uganda are Christian and 11 percent Muslim, with some eastern areas having large Muslim populations. Muslims have come to outnumber Christians in Nalugondo village. “It is quite difficult to resist these militant Muslims, because they have outnumbered us the Christians and are accusing us that we are defiling their faith,” Kijali said. 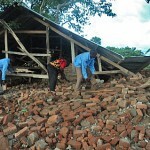 The church’s 450 members are now without shelter as the rainy season descends, sources said. Musical instruments, more than 500 plastic chairs and other property weredestroyed, a church leader said.